Please follow link to the notes of the second Endeavour Wharf Design Focus Group Meeting. The meeting engendered an enthusiastic and useful debate regarding possible design solutions for a new Offshore Energy Facility at Endeavor Wharf, Whitby. Dalby Offshore now intend to procure architects over the coming weeks and undertake wider public consultation to develop final designs for the scheme. A stakeholder focus group recently met with the developers of the proposed Yorkshire Offshore Renewable Energy Centre (Dalby Offshore Services Ltd.) to start discussions about the design and appearance of a new facility which is to be located at Endeavour Wharf, Whitby. The purpose of the meeting was to obtain local input into the design brief for any future development at the site. The Focus Group, consisting of volunteers and representatives from local organisations and businesses, working alongside 3 architectural practices, took part in an interactive discussion to develop outline building design specifications. The outcome of these discussions (a summary of which can be found here: WW Endeavour Wharf Focus Group 4-10-14) is now being used by the architects to draft some concept proposals for the development. These will be presented to the Focus Group at its next meeting in December. Parkol Marine Engineering Ltd is a ship building and vessel repair company based in Whitby in North Yorkshire. Parkol offers a full range of marine engineering services to the fishing, workboat and pleasure craft industries. As well as providing great client service to existing customers the management team actively pursue new market areas and have recently invested in facilities and staff training in readiness for taking advantage of opportunities in the East Coast wind farm industry (Dogger Bank and Hornsea Windfarms). Parkol complements the needs of this sector in being able to provide fast response vessel repair and maintenance services and as such it offers an exciting opportunity for further diversification of the core business. Accordingly Parkol are working with Scarborough Borough Council to actively support the Whitby and Scarborough Offshore Wind venture. Parkol proudly continues the long heritage of ship building in Whitby and is located at Eskside Wharf on the original site of three dry docks which date back to the early 1700s. Parkol was first established in 1971 and carried out vessel repair and maintenance from a site at Spittal Bridge before moving to larger premises at Eskside Wharf in 1992. The facilities on Eskside Wharf comprise of two work sheds (35m x 20m and 20m x 7m) and two boat building berths which can accommodate new builds up to 27m long x 8m beam. There is also a floating dry dock with a capacity of up to 450T (vessel size 5m draft x 42m long x 10.5m beam) and mobile crane with 50T capacity. The services provided include steel, aluminium, stainless fabrication, overhauls, repair and maintenance, hydraulics, electronics, pneumatics, refrigeration, installation of equipment and machinery, cleaning and painting, shot-blasting, ultra-high pressure water-blasting and zinc coating. From new builds to repairs and refurbishment, Parkol’s reputation is built on providing a bespoke product and quality service utilising its 40 skilled in-house staff who take much pride in their work. The company has built 32 vessels since 1997 ranging in length from 10 to 27m for all types of use and fishing methods. These include twin and single rig trawlers, pair trawlers, gill netters, pair seiners, vivier crabbers, scallopers, pilot vessel and pleasure craft. The vessels have been built for clients all over the UK ranging from the Shetlands Islands, East and West Coast of Scotland, Cumbria, Yorkshire Coast, Pembrokeshire to Cornwall and Devon. The company also has experience at carrying out specialist one-off projects such as wheelhouse and casing enlargements, vessel lengthening and sheltering, vessel type conversions, fuel efficiency upgrades, custom made nozzles, vessel re-engining and hull shape modifications. Parkol recently diversified into the workboat sector building vessels for the salmon farm industry and its current vessel a 27m overall length, 23.95m registered, 9.4m breadth twin screw salmon feed carrier is due for delivery in December 2014. The vessel is being built for LCL Shipping Ltd and will be equipped with a stable platform for crane operations and will carry 190 1T salmon feed bags in a single cargo hold. Parkol has a small locally based management team led by Managing Director Jim Morrison and comprises of in-house Naval Architect, Fabrication, Engineering and Project Managers. This professional dedicated team is able to respond quickly to clients’ needs and has a track record of providing robust workable solutions. Coupled with a highly skilled manufacturing and technically competent workforce Parkol has built up a wide client base that generates a high level of repeat business. This month Whitby and Scarborough Offshore Wind are featured in leading offshore wind energy journal, Wind Energy Network Magazine. Over 30 stakeholders representing more than 20 local organisations met at Sneaton Castle in Whitby on Tuesday 7 October to discuss the future use of the town’s Endeavour Wharf. Local offshore wind company, Dalby Offshore Services Ltd, Scarborough Borough Council’s preferred tenderer for taking on a lease of a proportion of Endeavour Wharf, gave a presentation on their proposals. Owner and Managing Director of Dalby Offshore Services, Stuart McNiven, explained how Dalby wishes to take on a lease at the wharf to develop ‘Yorkshire’s Offshore Renewable Energy Operations and Maintenance Centre’ and believes the development will bring with it significant investment in the town, revitalise the port and provide several hundred job opportunities within the borough. “The purpose of the meeting was to inform stakeholders of the proposals, provide a platform for initial comments and invite them to work with us and Dalby Offshore Services on the detail of any future developments on the site. A focus group will be set up with the stakeholders to work up designs and plans for the new facility, which will then go out to public consultation in the coming weeks. UPDATE – Endeavour Wharf- Whitby- a future in offshore wind? For over four years Scarborough Borough Council and the Whitby Harbour Board have been actively seeking to increase commercial activity in Whitby Harbour. In particular we have been working to promote the Borough as great location to establish offshore wind operations and maintenance activity. Over this period the Council have undertaken numerous consultation events, supply chain development activity and educational events etc. to try and encourage both the industry and our communities to engage with this opportunity. Over the past months the Council have received a number of enquiries from organisations wishing to explore establishing offshore wind related activity in our ports, particularly in Whitby. Whitby is the closet serviceable UK port to the proposed offshore wind development site at Dogger Bank. Acting on these enquiries the Council and the Whitby Harbour Board invited open tenders for a lease of a proportion of Endeavour Wharf in June of this year. Following this process Dalby Offshore Services Limited, a locally based offshore wind company, were identified as the Councils preferred tenderer in September 2014. Dalby propose the establishment of an offshore wind operations and maintenance hub on Endeavour Wharf bringing with it a significant number of new job opportunities and new vessel activity in the port. In brief, the proposal suggests the establishment of a centre to undertake personnel and equipment transfer, vessel management operations and vessel servicing activity. The company also wish to include within the development an offshore renewables information / visitor centre which will be open to the public.. However, prior to entering into any lease , the Borough Council and Whitby harbour board are now working together to explore this proposition and undertake consultation with stakeholders and community to assist in developing the proposals further. Whitby Port, the economy of our Borough and the wider region needs to grow and diversify if it is to remain sustainable, prosperous and successful. Importantly our communities desperately need opportunities for high quality local employment. Over £40bn is being invested in offshore wind development in the waters off the Yorkshire Coast, resulting in the creation of 10’s of thousands of jobs nationally. Due to our geography and port infrastructure we have the opportunity to secure some of that investment. Predominantly our opportunity lies in the supply of services, maintenance activity and the provision of personnel to the offshore wind sector. Although Whitby Port maintains strong fishing, leisure, boat manufacture and tourism functions, it also has significant potential to once again provide good commercial port facilities for other maritime industries, particularly upon Endeavour Wharf, bringing with it jobs, prosperity and greater economic security. Isn’t this already a “done deal”? No lease agreement or formal agreement of any kind has been entered into. The Council and the Harbour Board have only made Dalby Offshore Services preferred tenderer for the Endeavour Wharf lease. This simply gives all the parties the confidence required to engage meaningfully with stakeholders and the community; and to work together to develop proposals before making the decision to enter into any agreement. Why the “secret” Cabinet meeting in September then? The report to Cabinet 16th Sept 2014 regarding the decision to make Dalby Offshore Services preferred tenderer contained commercially sensitive information about the tenderer/s business undertakings, finances, references etc. For this reason alone the report was restricted. note the recommendation of the tender evaluation panel and approve the appointment of Dalby Offshore Services Limited (DOSS) as the preferred tenderer for the Endeavour Wharf lease. to enter into detailed negotiations with DOSS and undertake wider stakeholder consultation and to clarify any lease terms. provide a further report to Cabinet in due course reporting on the outcome of such negotiations and consultation, including the detailed terms of any lease arrangement, and seeking final authorisation to enter into a lease with DOSS. What will the development look like if it goes ahead? Stakeholder views on this are critical, all parties realise this is one of the most important elements of a development in a historic town like Whitby. Dalby Offshore are committed to bringing forward a high quality proposal. They, the Council and the Harbour Board want very much to work with the stakeholders and the community to make sure we get your input and contributions. There will be a number of consultation events to gather people’s views on this element of the scheme. Will there be a planning application? No, this is unlikely, unless the proposals change. One of the pass fail criteria of the invitation to tender was that only permitted development activity would be considered. The outline proposals as they currently stand are within the definition permitted development. i.e. they’re in line with the undertakings of a port and are associated with the transfer of persons, equipment and cargo etc. onto vessels. However prior to any permitted development application, given the sensitive environment in which this proposal is to be located and the possible implications this may have on stakeholders, the Council’s Development Control service is calling for the tenderer to undertake meaningful consultation with stakeholders and the community; and to demonstrate that any proposals do not detract from the environment in which they are to be established. What about the loss of parking? Public parking is undoubtedly very valuable to Whitby and its economy, the proposed lease area, if utilised, will take away approximately 70 temporary public parking spaces. However a recent re-organisation of parking at the upper harbour and the introduction of the park and ride scheme more than offset this reduction. Importantly, Endeavour Wharf is a working port facility and therefore this should be its primary function if at all possible. Parking on the site has only ever been on a temporary basis until such time as alternative port uses could be found. Is there room for this development, what about the impact on other harbour users and businesses? The proposals suggest using a proportion (about 1/3 rd) of the wharf and to have a number of associated vessels berthed within the Port. Previously the Port accommodated 24 large trawlers as well as all of the other port users and Endeavour Wharf itself handled 300 cargo vessels movements per year and over 150,000 tonnes of cargo. These days the port has very limited trawler activity and no cargo or cargo vessels. Therefore there is ample room to accommodate this development and an increase in vessel traffic and berthing before the Port comes anywhere near reaching capacity. How do I get involved what is the process? What is the timetable for the process? We hope to have undertaken the majority of the consultation and negotiation for this scheme by the end of December 2014. We will then report the outcome of this work to the Council and decide how to proceed. Ultimately it is the ambition of the tenderer to have the proposals implemented and operational by the beginning of 2016. Whitby Harbour Board and Scarborough Borough Council have given their backing to making local company, Dalby Offshore Services Ltd, the preferred tenderer to develop proposals for a new offshore business to be located at Endeavour Wharf, Whitby. Following an open market tender process held during the summer for a lease of a proportion of the wharf, Dalby Offshore Services was selected by a joint evaluation panel made up of members of the harbour board and the council. “We are delighted to make this announcement and at having the chance to work together with Dalby Offshore Services for the future of our ports. However it is important that people know we are still at an early stage in the process; we have not yet entered into any lease or binding agreements and are still at the negotiation and development stage. Dalby Offshore Services is proposing the set-up of ‘Yorkshire’s Offshore Renewable Energy Operations and Maintenance Centre’ in Whitby. If developed the centre will act as the company’s control, crew transfer and management centre for offshore operations in the northern North Sea, primarily in support of offshore wind development. The company also wants to make Whitby the home port for its growing offshore services fleet. “This is a great opportunity for us as a company, for Whitby and for the region as a whole. The offshore wind sector is poised for massive expansion and together we can be at the forefront of that opportunity. “Strategically, Yorkshire needs to cement its place in the service of the offshore wind sector and Whitby and Scarborough are ideally placed geographically to act as the centre for that activity. Dalby Offshore Services is an established marine services and charter company with a fleet of vessels working throughout the globe. In recent years it has focussed on providing vessel support and crew transfer for the major contractors in the offshore wind industry. The company was also one of the lead contractors on the ground breaking Costa Concordia salvage project, off the Italian coast. It has offices throughout the UK and abroad, including a recently opened office in Scarborough and its head office is located in Beverley. “We are very pleased to be working with Dalby Offshore Services on bringing forward these proposals. If they are successful, they could prove a massive boost for our economy, potentially bringing hundreds of new jobs and an entirely new industry sector to our borough. A diverse economy is critical to future stability, resilience and growth. This proposal could also open the doors to major opportunities for our local supply chain companies. Dalby Offshore is a vessel and marine operator based in Yorkshire and working around the world on a number of projects. Established in 2007 by Stuart McNiven a former Ship’s Captain and Senior Executive with the APMoller/Maersk Group Dalby Offshore has established itself as a Company that focuses on a quality of service and attention to clients requirements. Dalby has a number of blue chip clients and has achieved preferred supplier status to a number of Tier 1 organisations. Dalby own, operate and manage a fleet of fast, high specification, multi functional Wind Farm Support Vessels, an industry they have supported since 2009.Additionally a large accommodation Barge The ASV Pioneer and various other tugs and workboats either owned or chartered. 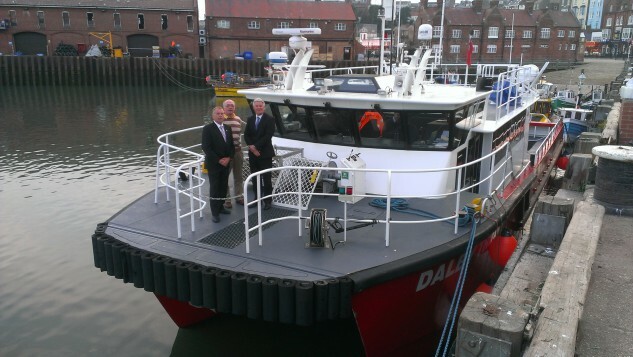 Dalby Offshore have made a significant commitment and investment to the Offshore Wind Farm Crew Transfer Vessels with two vessels added to the fleet in the summer of 2014, the Dalby Swale & Dalby Wharfe which have gone straight out to work on the Greater Gabbard Wind Farm for SSE. Further investment is planned over the next 3 years with the next delivery being a new 30m vessel due delivery in early 2015. This vessel will be capable of carrying 16 persons offshore for up to 7 days and we expect the vessel to have a high level of interest to assist in diving operations and survey. Our fleet of vessels are fully classed and in conjunction with our builders, Alicat are designed to provide safety and comfort for passengers and crew whilst working in all environments. The ASV Pioneer – can hold up to 120 crew and personnel whilst offshore and has just finished a significant contract in Italy as a ‘Salvage Support’ unit this adding to Dalby Offshores list of services. The Pioneer was a key part of the biggest and most expensive marine salvage in History, the Costa Concordia and was on site for over 16 months .Dalby had a number of other vessels on the project and from the pioneer catered for over 300 people on a 24/7 basis for many months. Dalby Offshore offer a number of different marine services and as the owned fleet builds we expect these services to expand. Our core of dedicated professionals are flexible and as a relatively small team capable of moving quickly in respect of business opportunities. Dalby Offshore’s head office is based in Beverley, East Yorkshire. We also have an office in Lowestoft, Norwich and recently opened an office in Scarborough, North Yorkshire. The Hometown of Dalby Offshores Owner & Managing Director Stuart McNiven. Its hoped that Whitby and Scarborough in the future will be utilised for smaller vessel operations, particularly on the proposed Dogger Bank and Hornsea Offshore Wind Farm that are scheduled to start construction in 2016. The Scarborough office is based in the historic building the ‘Toll House’ and was built in 1900 as a toll house that connects the North & South bays of Scarborough. The new office will provide support for existing operations and will be used as a crewing/ admin office. A small gathering saw the Mayor of the Borough of Scarborough officially open the premises, where friends, colleagues and VIPs toasted to having Dalby Offshore in Scarborough Town. This is seen as a “small toe in the sea” to see what happens with the Round 3 Wind farms. WHITBY TO HOST A NEW MARITIME TRAINING Co.
Whitby Fishing Industry Training Centre (WFITC) will play a vital role in training new entrants and upskilling those with existing maritime experience to enable them to gain employment in the expanding offshore renewables industry. WFITC was established in April 2002 with the initial aim of delivering quality training to new, younger entrants to the sea fishing industry, as well as further enhancing the skills of existing fishermen. The company has evolved and grown since then and now looks to deliver high quality safety training to all maritime and related sectors. WFITC Chief Executive Anne Hornigold said, “Whitby Fishing Industry Training Centre has worked hard to achieve an excellent reputation with companies across the UK for providing top quality safety training to the maritime industry. In fact such is the demand for our safety training courses we have now launched a sister company – ‘54 North Maritime Training’. Renewable energy companies and their partners should take note of our newly created sister company – ‘54 North Maritime Training’ – which will be responsible for delivering STCW and advanced maritime training courses. For more information about 54 North Maritime Training and the courses on offer you can call us on 01947 602098. Whitby Fishing Industry Training Centre will play an important part in improving safety for seafarers in the delivery of STCW’95 safety courses. 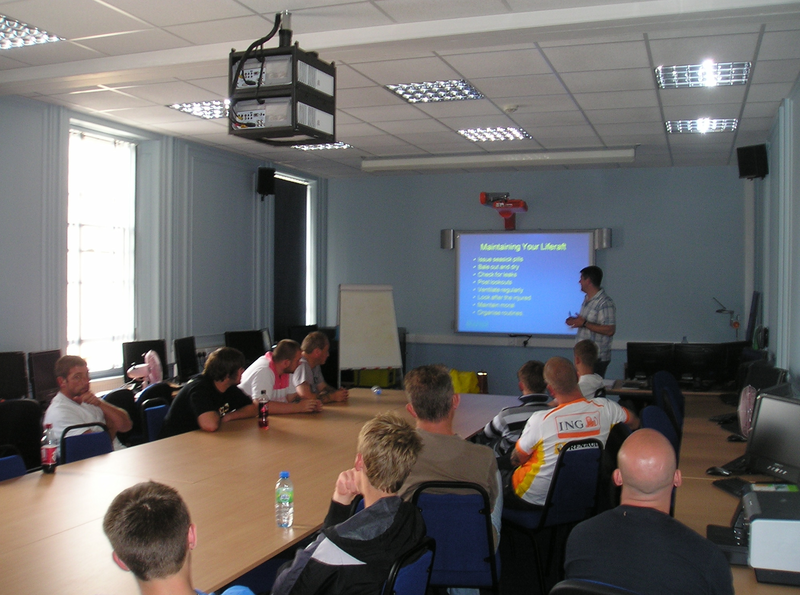 Whitby Fishing Industry Training School and the company’s rapidly-expanding offshore training arm ‘54 North Maritime Training’ will play a vital role in delivering the Maritime Coastguard Agency (MCA) Standards of Training, Certification and Watchkeeping (STCW’95) courses. The company is a multi-award-winning organisation and an approved training provider for the MCA and the Sea Fish Industry Authority and will deliver a 5-day set of STCW courses to include Personal Survival Techniques, Personal Safety & Social Responsibilities (PSSR), Elementary First Aid and the 2½ day Fire Prevention & Firefighting course. The firefighting course is a mandatory requirement for crew members on vessels of more than 24 metres, and required by many of the Offshore Wind companies regardless of size of vessels.